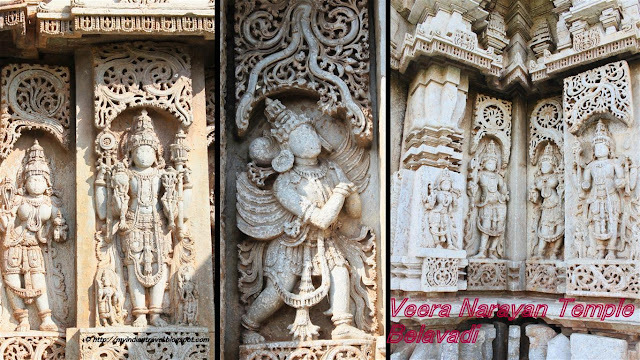 Veera Narayana Temple located in Belavadi is an ancient 12th century temple carved in soapstone. This temple comprising of three shrines was built during the rule of the Hoysala King Veera Ballala II. In this temple with unique architecture each of the three shrines has a complete by itself with tower on top of the shrine. Among the three shrines, two of the shrines face each other and are located on either side of a wide and spacious open hall with thirty seven bays. The central shrine is much older and its inner walls are plain with well decorated roof. In all, the temple complex has fifty nine bays that is exhibited by many pillars. While most of these pillars are lathe-turned and bell shaped, some have decorative carvings on them. The outer wall of the temple has many eaves running around the temple. Below this are miniature decorative towers on pilasters. A panel of Hindu deities and their attendants are below this eves followed by a set of five moldings that form the base of the wall. All shrines have sculptured decoration on the towers, and the sculptures on the walls are bold and are visible from a distance. These beautiful sculptures represent various forms of deity of the temple.